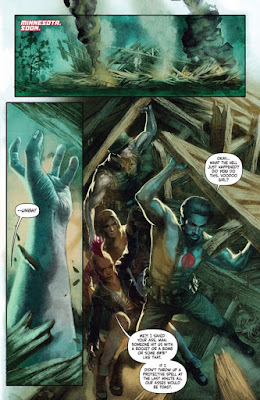 At the close of Bloodshot Salvation #5, released in January of this year, we saw our hero, Ray Garrison, aka Bloodshot, break free of his captor and defeat his girlfriend’s crazed cult leader father, known as Daddy. Though this certainly was a great win for Garrison, we are left wondering what will happen next with his infant daughter, Jessie, as the nanites that she inherited from her father are taking over her body and slowly killing her. 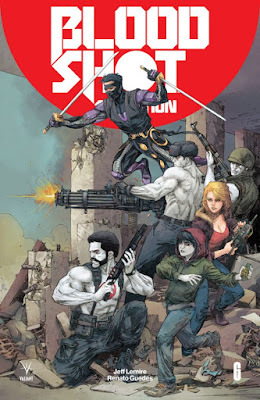 Desperate to save his daughter and acknowledging the fact that he would have to take on the persona of Bloodshot once more, Ray seeks the help and advice of Ninjak who tells him he may know of a place that can cure young Jessie of her illness and save her life. The story of Ray Garrison has been outlined very well in this series, written by Jeff Lemire, and this particular issue is certainly giving us a bridge to the brand new story arc of the title, which is being marketed as “The Book of the Dead.” The climactic ending of this particular issue, as well as the title of the new story arc certainly leads us to believe that there are some creepy horrors in store for our hero and his little family. I enjoy this series a lot and though I am certainly looking forward to the next issue that will show us just how far Bloodshot is willing to go to save his daughter, I found the dialogue in this issue a little bit distracting. As I mentioned earlier, the concept is interesting and the story itself has so much potential, but unfortunately I just found issue six to be lacking when it came to making an intense emotional connection with myself as a reader. With the storyline being as intense and heartwrenching as it is, I wish I could have felt that displayed more in Lemire’s writing, especially in the dialogue exchanges between characters, particularly with Ray and his girlfriend, Magic. In my opinion, dialogue appeared to be a little forced and inauthentic, which caused this particular issue to suffer slightly. The art, on the other hand, had quite the opposite effect. Brazilian artist Renata Guedes, known for his work with Marvel’s Wolverine series as well as DC’s Constantine, which was also written by Lemire, brings a really unique take on the series in this issue. His work on this issue is positively stunning, bringing a dark yet ethereal quality to the pages of this intense story. The renderings almost look like they are chalk drawings, so the colors are vibrant and the heavy shading adds drama and realism to both scenes and characters. Guedes’ art definitely captures the horror surrounding the plot of this story and as a new artist on this series, I think Valiant Entertainment made a great call with choosing him for this issue. The foreboding final pages of this issue certainly held my attention and gave me high hopes for what is to come in issue seven. I would love to see Guedes continue to work with Lemire on this story and remain positive that the dialogue and emotional intensity will get ironed out eventually.